When word of the opening attack reached ROK 8th Division headquarters in Hoengsong, division commander Brig. Gen. Choi Yong Hee ordered the 21st Regiment to make a short withdrawal and instructed Support Team B to move back down Route 29 and join Support Force 21 at Ch'angbong-ni. The armored team reached the artillery force about 2200. Some of the 198th Division forces who had swept around the 21st meanwhile raced down both sides of Route 29, bypassed the American position at Ch'angbong-ni, and blocked the road near a bridge three miles farther south. Ruffner's deference to corps emphasized the command and control arrangement for which General Ridgway had expressed concern the day before. As a matter of orders, and as an eventual matter of practice in controlling the artillery support forces, unity of command in Operation ROUNDUP was vested in corps headquarters, no lower. The arrangement worked well enough during the advance. But after the Chinese engineered the collapse of the ROK 8th Division, corps control inhibited the American commanders of support forces and of units on the line of departure in reacting rapidly. How much this inhibition assisted the Chinese is moot. Delays and piecemeal movements among the smaller American units nevertheless colored the course of withdrawal operations. 1 X Corps Comd Rpt, Nar, Feb 51; X Corps Rpt, The Battle of Hoengsong. 2 Ibid. ; Ltr, CG Eighth Army to CINCFE, 1 Mar 51, sub: Performance of the 5th and 8th ROK Divisions, 11-13 February 1951. 3 X Corps Rpt, The Battle of Hoengsong; Ltr, Lt Col Harold Maixner, CO 3d Bn, 38th Inf, to CO 38th Inf, 15 Feb 51, sub: Summation of Action of 3d Battalion, 38th Infantry, During the Period 11-12 February 1951 (hereafter cited as Maixner Ltr); Ltr, Lt Col William P. Keleher, CO 1st Bn, 38th Inf, to CO 38th Inf, 14 Feb 51, sub: Summation of Action of 1st Battalion, 38th Infantry During the Period 11-12 February 1951 (hereafter cited as Keleher Ltr). 4 X Corps Rpt, The Battle of Hoengsong; Kessler Testimony, 15 Feb 51. 5 X Corps Rpt, The Battle of Hoengsong; Ltr, CG Eighth Army to CINCFE, 1 Mar 51, sub: Performance of the 5th and 8th ROK Divisions, 11-12 Feb 51. 6 Ltr, Hq 2d Div Arty to CG 2d Div, 16 Feb 51, sub: Responsibility for Losses of Personnel and Equipment of Support Force 21 (hereafter cited as 2d Div Arty Ltr), Incls 1 and 7; Ltr, Maj Warren D. Hodges, S3, 38th Inf, to CG 2d Div, 17 Feb 51, sub: Report on Activities, 12-13 Feb 51 (hereafter cited as Hodges Ltr); Keleher Ltr. 7 Ltr, Col Edwin J. Messinger, CO 9th Inf, to CG 2d Div, 16 Feb 51, sub: Report of Investigation, with Incls 1 and 2. 8 X Corps Rpt, The Battle of Hoengsong; Ltr, Office of the IG, KMAG, to IG Eighth Army, 22 Feb 51, sub: Losses Sustained in Action North of Wonju, I 1-13 February 1951. 9 Eighth Army G3 Jnl, Sum, 12 Feb 51; ibid., Entries 0600 and 1550, 12 Feb 51; X Corps Rpt, The Battle of Hoengsong, and Incl 4, Action of the 11th ROK FA Battalion. 10 X Corps Rpt, The Battle of Hoengsong; Ltr, Lt Col Milton G. Norum, Exec Off 38th Inf, to CG 2d Div, 15 Feb 51, sub: Losses of Materiel and Personnel (hereafter cited as Norum Ltr); Keleher Ltr; Ltr, 1st Lt George W. Gardner, CO Co A, 38th Inf, to CO 1st Bn, 38th Inf, 16 Feb 51, sub: Summary of Combat Action of Company "A," 38th Inf Regiment, During 11-12 February 1951 (hereafter cited as Gardner Ltr). 11 Ltr, Brig Gen George C. Stewart, ADC 2d Div, to CG 2d Div, 19 Feb 51, sub: Investigation of Heavy Losses of Material and Personnel in 2d Division Task Force Operating in Support of 8th ROK Division (hereafter cited as Stewart Ltr); Testimony Before Eighth Army IG by Col William P. Ennis, Jr., CG X Corps Arty (hereafter cited as Ennis Testimony), 16 Feb 51; Hodges Ltr; X Corps Arty S3 Jnl, Entry 6, 12 Feb 51. 12 X Corps Rpt, The Battle of Hoengsong; Stewart Ltr, Incl 2, Exhibit C-11; 2d Div Arty Ltr, Incl 1. 13 Stewart Ltr, Incl 2, Exhibit C-11. 14 Ibid., Exhibits C-11 and C-12. 15 Ibid., Exhibits C-11, C-14, C-15, and C-16. 16 2d Div Arty Ltr, Incls 1 and 7; Keleher Ltr. 18 2d Div Arty Ltr, Incl 7; Keleher Ltr. 19 Gardner Ltr; Ltr, Lt Col William P. Keleher, CO 1st Bn, 38th Inf, to CO 38th Inf, 15 Feb 51, sub: Supplement to Summation of Action of the 1st Bn, 38th Inf, During the Period 11-12 February 1951. Gardner's executive officer actually reported finding two howitzers. Since Battery A, 503d Field Artillery Battalion, had only five pieces and had taken one south, the count between Gardner and his executive officer was off by one. The 15th Field Artillery Battalion later reported the loss of one 105-mm. howitzer during the withdrawal from Ch'angbong-ni. Perhaps this weapon was one of those reported by Gardner's executive officer. 22 Ibid. ; 2d Div G3 Jnl, Entry 57, 12 Feb 51. 23 Maixner Ltr; Hodges Ltr. 24 X Corps Rpt, The Battle of Hoengsong, and Ind 8, After Action Interview, 38th RCT; X Corps Arty S3 Jnl, Entry 11, 12 Feb 51; 2d Div G3 Jnl, Entry 28, 12 Feb 51; Norum Ltr. 25 2d Div G3 Jnl, Entry 49, 12 Feb 51; 2d Div Arty Ltr, Incl 1. 26 X Corps Rpt, The Battle of Hoengsong; 2d Div 63 Jul, Entries 59, 67, 71, and 74, 12 Feb 51. 27 Ennis Testimony, 16 Feb 51. 28 Eighth Army Comd Rpt, Nar, Feb 51; Eighth Army G3 Jul, Sum, 12 Feb 51; X Corps Comd Rpt, Nar, Feb 51; X Corps PIR 139, 12 Feb 51; 2d Div G3 Jul, 12 Feb 51; 2d Div G2 Jnl, 12 Feb 51. 29 Interv, Eighth Army IG with Lt Col Barney D. White, CO 49th FA Bn and SF 7; 49th FA Bn Unit Rpt no. 134, 12 Feb 51. 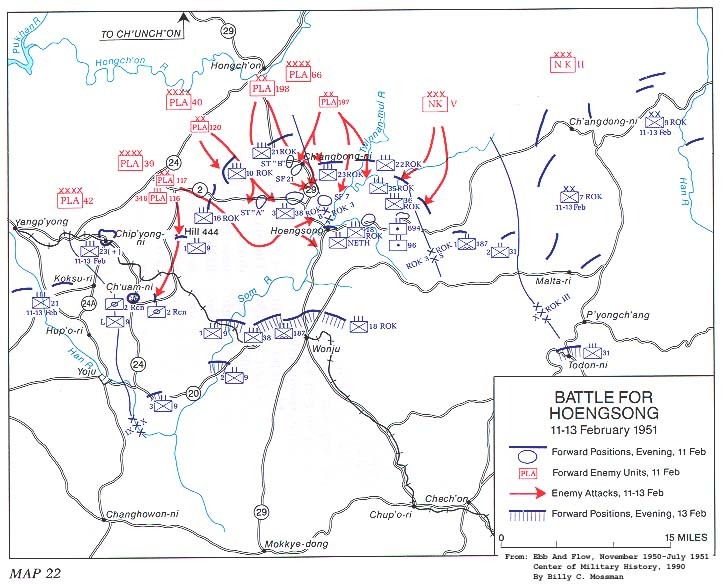 30 X Corps Rpt, The Battle of Hoengsong. 31 Keleher Ltr; Hodges Ltr; Norum Ltr. 32 Interv, Eighth Army IG with Lt Col Jack F. Wilhm, Actg Armored Off, X Corps; Norum Ltr; Hodges Ltr; Stewart Ltr, Incl 2, Exhibit C-1. 35 Staff Sec Rpt, Office of the CG Eighth Army, Feb 51, Incl 12; Eighth Army G3 Jul, Sum, 12 Feb 51; ibid., Entries 1416 and 1605, 12 Feb 51; X Corps Comd Rpt, Nar, Feb 51; X Corps OI 104 (confirms oral instructions), 12 Feb 51. 36 X Corps Comd Rpt, Nar, Feb 51; Rad, GX-1-1287 KG, CG Eighth Army to C/S ROKA and CG X Corps, 12 Feb 51. 37 Maixner Ltr; Keleher Ltr; Norum Ltr. 38 Interv, Eighth Army IG with Wilhm; Stewart Ltr, Incl 2, Exhibit C-1. 39 Ibid. ; 49th FA Bn Unit Rpt no. 135, 13 Feb 51. 41 Ennis Testimony, 16 Feb 51; 49th FA Bn Unit Rpt no. 134, 12 Feb 51, and no. 135, 13 Feb 51. 42 X Corps Rpt, The Battle of Hoengsong; 49th FA Bn Unit Rpt no. 135, 13 Feb 51; Stewart Ltr, Incl 2, Exhibit C-1. 43 Stewart Ltr, Incl 2, Exhibit C-1; Norum Ltr; Hodges Ltr; Maixner Ltr. 44 Stewart Ltr, Incl 2, Exhibit C-1; Hodges Ltr. 45 Norum Ltr; Maixner Ltr. 46 X Corps Rpt, The Battle of Hoengsong; Norum Ltr; Ltr, Gen M. B. Ridgway to Mrs. M. P. A. den Ouden, 20 Mar 51, copy in CMH. 47 Ltr, Lt Col Barney D. White, CO 49th FA Bn and SF 7, to CG 2d Div, 17 Feb 51, sub: Evacuation of 49th Field Artillery Battalion From Osan-ni, Korea; 49th FA Bn Unit Rpt no. 135, 13 Feb 51. 48 49th FA Bn Unit Rpt no. 135, 13 Feb 51; Interv, Eighth Army IG with White. 49 Stewart Ltr, Incl 2, Exhibits C-7, C-10, C-11, and C-12; Maixner Ltr; Keleher Ltr. 50 X Corps Rpt, The Battle of Hoengsong; 2d Div G3 Jul, Entries 7 and 17, 13 Feb 51; Norum Ltr; Stewart Ltr, Incl 2, Exhibits C-7, C-10, and C11. 51 Figures compiled from X Corps Rpt, The Battle of Hoengsong; Ltr, Eighth Army IG to CG Eighth Army, 12 Mar 51, sub: Report of Investigation Concerning the Loss of Equipment by X Corps; Lt Col Eugene Wolfe, Asst IG Eighth Army, Tabulation of Personnel Losses Suffered by X Corps Units, 11-13 February 1951; Memo, X Corps G1 to CG X Corps, 13 Feb 51, sub: Casualties, 11-13 February 1951; Rad, X 17780, CG X Corps to CG Eighth Army, 13 Feb 51. 52 Lt Col Eugene Wolfe, Asst IG Eighth Army, Tabulation of Major Items of Equipment Lost by X Corps Units, 11-13 February 1951. 53 Ltr, Gen Ridgway to Gen Almond, 13 Feb 51, copy in CMH. 54 Memo, Office of the CG Eighth Army for The Inspector General, Headquarters, Eighth Army, 14 Feb 51. 55 Rad, X 17778, CG X Corps to CG 2d Div, 132321 Feb 51. 56 Ltr, Gen Almond to Gen Ridgway, 14 Feb 51, copy in CMH. 59 Ltr, Eighth Army IG to CG Eighth Army, 12 Mar 51, sub: Report of Investigation Concerning the Loss of Equipment by X Corps. 60 Check Slip, Eighth Army Chief of Staff to IG, 22 Mar 51, sub: Investigation Concerning the Loss of Equipment by X Corps; Rad, GX TAC 7 KCG, CG Eighth Army to CG I Corps, IX Corps, X Corps, and KMAG, 14 Feb 51.